After the first edition of OUT OF THE BLUE presented in the Display in Hoensbroek we open up the call for the screening at the Chapel during the Current Residents and Associates which will be from 19-23 April. 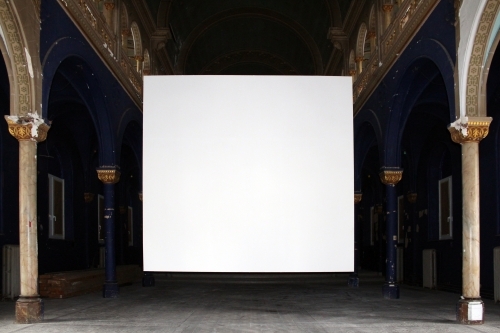 Greylight Projects invites artists to sent in video works that can be shown in The Chapel in Brussels. All contributed videos sent in are added to the database and can be selected by the algorithm. When no video is selected there will be a blue screen awaiting the next selection. There is no specific theme to this call. The video’s can be with sound and are shown on a wide screen (16:9). The OUT OF THE BLUE presentation starts April 19th and will be on view till April 23 2017. Screening days: Wednesday (17:00-21:00) Thursday, Friday and Sunday (10:00-18:00). On Staurday there will be a concert in the Chapel instead of the screening. video size is 1920 x 1080 pixels. video duration can be from 1 second till max 15 minutes. slideshows or single images are allowed thought placed in a mp4 video format. video format must be mp4 (you can use Handbrake to render it to mp4, standard settings). there is no guaranty that your video will be selected by the algorithm. deadline is April 17th at midnight. there is no limitation of age, gender or location. inappropriate content will be deleted without prior notice.